The country says it released him for health reasons. Hyeon Soo Lim speaks during a news conference at the People's Palace of Culture in Pyongyang, in this undated photo released by North Korea's Korean Central News Agency in 2015. SEOUL, Korea, Republic Of — An Ontario church congregation is celebrating news of the release of their pastor from a North Korean prison more than two years after he was arrested in the country. A decision from North Korea's central court freed Hyeon Soo Lim from the prison where he was serving a life sentence for anti-state activities, the country's Korean Central News Agency reported Wednesday. The pastor's release, which came on the heels of an official visit from a Canadian government delegation, was described as "sick bail'' by the news agency. No other details were provided. 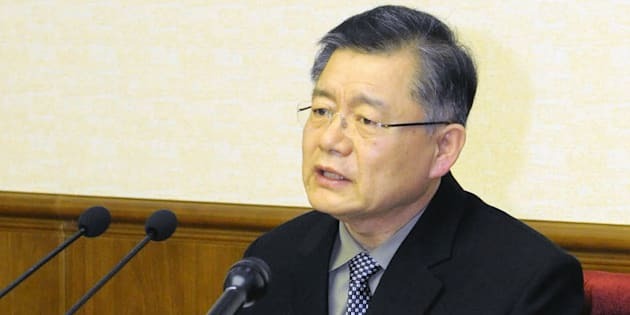 Lim, a pastor with the Light Korean Presbyterian Church in Mississauga, Ont., had been sentenced by a North Korean court to life in prison with hard labour for what it called crimes against the state. Charges against him included harming the dignity of the supreme leadership, trying to use religion to destroy the North Korean system, disseminating negative propaganda about the North to overseas Koreans, and helping American and South Korean efforts to help people defect from the north. Word of Lim's release drew members of his congregation to their church, just west of Toronto, where they were seen hugging and crying Wednesday morning. Charles Baik, an associate pastor with the church's English ministry, said members are ecstatic at the prospect of Lim's return. "We're so happy he's been released, '' Baik said from outside the church. Hyeon Soo Lim speaks during a news conference in Pyongyang, in this photo taken by Kyodo on July 30, 2015. Lim, who has a wife and son living in the Toronto area, started the Light Korean Presbyterian Church nearly three decades ago, shortly after he emigrated from South Korea. He grew the congregation from about a dozen people in 1986 to more than 3,000 members. He also runs a smaller church in downtown Toronto that caters to young people. The church has taken on numerous humanitarian projects in North Korea, one of which prompted Lim's last trip there in January 2015. Family and friends previously said he was visiting an orphanage, nursery and nursing home in the country at the time of his arrest. The pastor had successfully travelled to North Korea more than 100 times over the past two decades, they added. Baik said the pastor's ordeal would not deter the church from future humanitarian projects in the country. "Missions will never stop, no matter where they may be,'' he said. Family members had urged the Canadian government to put pressure on North Korea to secure Lim's release. Their calls for action took on fresh urgency in June following the death of Otto Warmbier, an American student who lived only one week after being released from North Korean custody due to health concerns. Otto Frederick Warmbier attends a news conference in Pyongyang in this photo released by Kyodo on Feb. 29, 2016. Lim's own health was of concern to his family members, who had said the pastor needed medication to manage his blood pressure. A Canadian delegation led by Daniel Jean, the national security adviser to Prime Minister Justin Trudeau, was in the North Korean capital of Pyongyang this week to discuss Lim's case. "Pastor Lim's health and well-being remain of utmost importance to the government of Canada as we continue to engage on this case,'' Cameron Ahmad, a spokesman for the Prime Minister's Office, told The Canadian Press on Tuesday. Neither Ahmad nor Global Affairs responded to request for comment on Lim's release. Canada does not have an embassy in North Korea, and has advised against all travel there.